There are many different types of 401k plans and some are better than others. In general, you hope that your workplace 401k plan has low fee mutual funds along with low management expenses. It’s also desirable for your 401k to have a point person, or offer access to professional advice for your questions. If your 401k investment choices are filled with high fee, actively managed mutual funds, company stock, or other less desirable choices you need to consider other types of accounts for your retirement dollars. In this case, only invest enough in your employer’s 401k plan to receive the company match, and invest the remainder of your retirement savings in a Roth IRA or traditional IRA outside of the company plan. This is absolutely false. What if you’re age 35 and you invest $100 per month for 30 years in your retirement account. Let’s take a conservative approach and assume that the $100 is invested each month in a fixed bond fund with an average rate of return of 3% per year. At age 65, your account will be worth $58,419. You’ll have invested $36,000 over 30 years and that money will not even double during the time it’s invested. You need to invest enough money and receive high enough returns to give you greater growth than 3% per year. Social Security won’t be enough to fund most people’s retirement, thus you must make up the difference. In general, you’ll need to invest at least 10% to 15% of your income, depending upon your age, in both stock and bond funds in order to have a comfortable retirement. Develop a reasonable asset mix and invest enough per month to fund the difference between your expected Social Security benefits and your financial retirement needs. Many of the retirement calculations ignore inflation. In fact, since 2008, we’ve only had one year where inflation hit 3%, and that was 5 years ago in 2011. Consider this reality, if you were born in 1988 and were given $10,000 at birth, when factoring in inflation’s impact, it would take $20,129 to purchase today (2016) what the $10,000 bought in 1988. That means, you need to invest your money for retirement so that it will grow and compound more quickly than inflation. Put another way, with an inflation adjustment, an investment in the S&P 500 stock index in April, 1988 would yield an annualized 4.991% return versus a 7.279% return without considering inflation’s impact. When calculating your future investment returns, don’t forget to factor in inflation. Maybe so or maybe not. Retirement investing requires making assumptions. When you invest in your 401(k), you are saving on taxes today, with the expectation that when you withdraw your retirement money in the future, you’ll be in a lower tax bracket. Yet, this may not be the case. 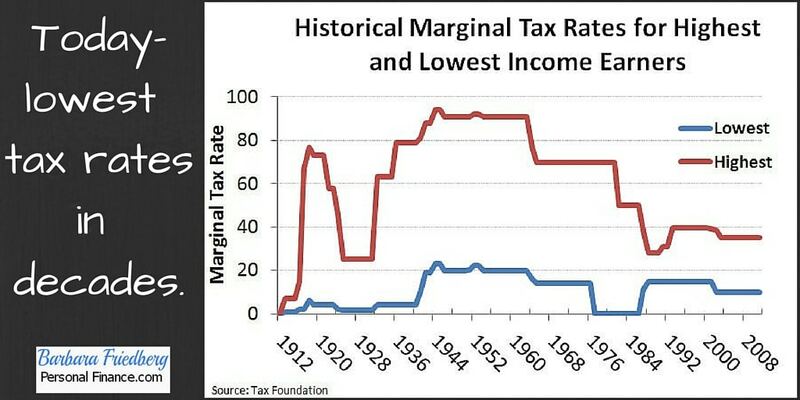 Just like we strolled down memory lane in the previous inflation myth section, let’s do the same with taxes. You may assume your income will be significantly lower in retirement, yet, remember that at age 70 ½ you’re required to withdraw from all of your retirement accounts except your Roth IRA. This required minimum distribution (RMD) will likely pump up your taxable income. Don’t assume that you’ll be in a rock-bottom tax bracket in retirement. In the future, income tax rates may drift upward and your taxable income may not be as low as you expect. When doing your retirement planning consider that your tax rate may not be lower when you stop working than it is today. Plan administration fees-Cover the day-to-day operation of the program. Investment fees-Every mutual and exchange traded fund (ETF) charges a fee, generally charged as a percent of assets under management. The lowest fee index funds might charge 0.05% whereas an actively managed mutual fund could charge up to 1.50% or more. Sales charges-Some investments come with a special commission fee, charged when the particular investment is bought and/or sold. These fees may be also be called ‘loads’. Service fees-These charges might be a flat monthly amount or a specific expense for participating in special plan features. Many employers offer employees the opportunity to buy company stock at a discount. Don’t assume that this is a ‘can’t miss’ opportunity. Regardless of how fabulous your company is, consider the importance of keeping your retirement monies diversified. Imagine if your company hits a rough patch and the company stock value tanks. Then, for added injury, you’re laid off. There is a major problem with over-investing in company stock. With the average 401k plan participant holding more than 7% of her investment portfolio in company stock, according to the Investment Company Institute, you may be accidentally setting your portfolio up for future losses. Diversification is the bedrock of successful investment management. The benefit of maintaining a diversified investment portfolio is that when one stock, fund, or asset class tanks, you’ll have others that counteract the drop and increase in value. If you have too much invested in your company stock, even bought at a discount, you’re opening up your financial future for the possibility of excess volatility and loss. Although the 401k is a wonderful type of account with many financial benefits, it isn’t perfect. 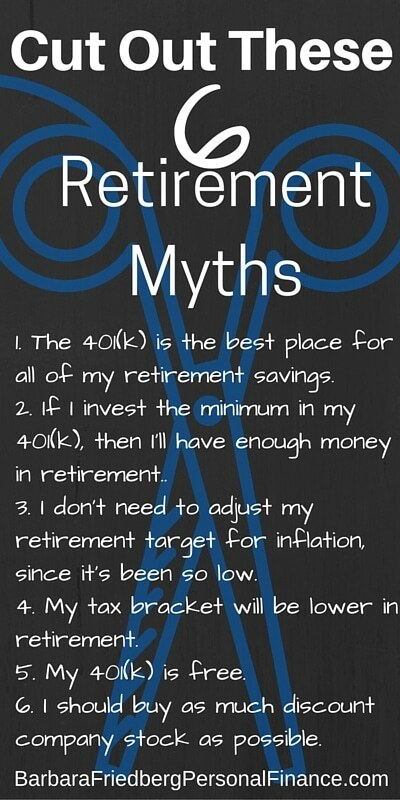 Be aware of 401k myths in order to shield your future self from unpleasant financial surprises. Click to read the original version of this article, published on Captain401. Hi Barb – #4 is right on the money. During my accounting days – mostly doing tax work – I found that a lot of people made more money in their 60s and 70s than when they were younger. This makes sense too. When you combine various income sources – Social Security, pensions, retirement plan withdrawals, income from business ventures, and self-employment income (the self-employed never actually retire) – you could be making a lot more income and paying a lot more income tax than you are now. I personally think that diversifying retirement income is critical, which is consistent with Myth #2. In addition to a 401k, you should also have non-taxable income sources in retirement, such as a Roth IRA and/or taxable investment accounts that can be tapped without having to pay taxes. It’s a form of income tax diversification in retirement, just in case rates are higher. Hi Kevin, Thanks for giving us the “accounting pro” viewpoint. Overall, your comment highlights how flexible we have to be when planning for the future. It is impossible to predict the scenario decades in the future. I echo your idea of having diversified income streams in addition to retirement accounts. One topic we didn’t cover is municipal bonds. Those are a solid stream of dividends free of federal and frequently state taxes. With interest rates poised to rise, dividend payments will also increase. As an aside, you don’t want to hold municipal bond funds in a retirement account, as they are already protected from tax liability. Hi Millennial, Before buying any stock, even company stock, make sure to research the revenue, profitability ratios, growth potential and valuation. If these metrics are positive, you might want to buy company stock. But as you suggested, limit the percentage of your co stock. Remember, you don’t want to watch your company hit a pitfall, you lose your job and your stock value plummets, all at the same time. Thanks for chiming in. For company stock at a discount, couldn’t you sell it after a certain period of time? Basically just taking advantage of the discounted price and not holding it for any significant period of time? In theory, of course that’s a possibility. Yet, in reality, stock prices change on a daily basis and there’s no guarantee that the stock won’t fall in value after you buy it. After the company determined holding period, you can always sell, but you’ll also pay transaction or commission costs as well. I still suggest keeping company stock purchases to a minimum.